We were at one of the Riverside’s cookouts when it struck us. We had purchased a car 3 weeks ago. We opened a bank account to use for our boat projects, we’ve played tennis and been getting back in shape. And we forgot about seasons. In the tropics there are two seasons rainy and dry – otherwise known as the cyclone season and not the cyclone season. Here in NZ we have 4 complete seasons with a significant change in the weather. And that change means we will need to see the South Island now or face a cold trek in the middle of winter. After having spent the last few years in the tropics neither of us Bolooked forward to a cold adventure. We had enough of those cold outings coming of age in the midwest US. So…we began to plan. Bob and Linda had made a similar trip last year and we invited them over. We want to pick their brains and hear of their adventure all the while taking notes and looking for ideas. A few hours later we had enough info to turn a few week trip into 6 months. With brochures in hand and an idea of what to do W/ began to put some dates down and make reservations. Two ideas were foremost in our thoughts as we started this road trip. First we would circumnavigate the S. Island counter-clockwise. This sets our car on the inside lane of the highway, away from the cliff edges. Driving in this lane around and through the Southern Alps is much safer. Second, we would make reservations up to a week in advance allowing us to change and adjust as needed. 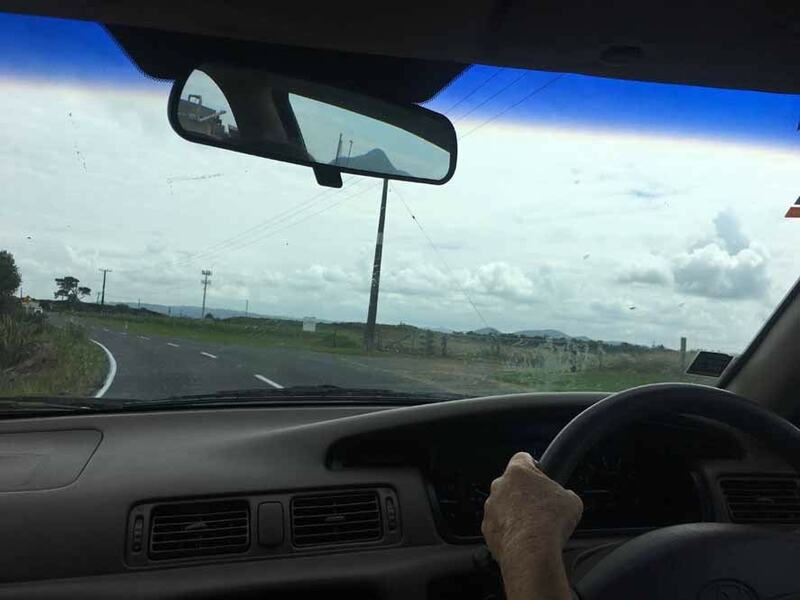 We left Whangarei heading to Auckland. Matt was there. After college and sailing with his family he moved to NZ. He’s sailed across the S. Atlantic, the Indian Ocean and made the trek from the S. Pacific a couple of times back and forth. He had kindly offered to be our evening’s tour guide in the “City of Sails”. Sometimes, things don’t seem right! We are still getting used to driving on the left side of the road with the driver on the right side of the car. The trip to Auckland was uneventful in general. Specifically, it was a bit o’ a pain. The weather was not pleasant. A Nor Easter was soon to arrive. We were racing it to Auckland hoping to beat it there by a few hours. Settled in at our AirBnB we decompressed waiting for Matt to finish work. I say decompress but for me I was setting up a NZ tollway account. There are few toll roads in NZ. Actually there is only one and it is in Auckland. There are no toll booths. New Zealand uses cameras to record auto license plates on the toll road and sync that with who owns the car. Then the car owner is either billed or pays on line. Billing costs more if one fails to pay on time. Failure to meet the deadline escalates the toll 1000%. Thus the need to set up an account. While the setup is pretty straight forward the log in requirements are not. It’s the little things that can frustrate me. OK, I’m use to PIN numbers. But this PIN needed Letters as well as numbers. 🙁 OK, most everything has a User name. However, with user names you get to choose it. This account gives you a User Name and it’s several numbers long. Finally after jumping through the site’s hoops I have the account setup. I added money, the easy part. Now I just need to wait for the bill and pay. I checked it the next couple of days and never saw a bill. Finally a week later I noticed that money had been taken from my account. I checked the history and they did see the car ( I never doubted it for a minute) and they did then bill the car. A week later our account NZ debited the account. Check that off the list. After a good dinner Matt took us on a tour of the city. With not a lot of faith in our driving yet, he drove. 🙂 That was fine by us. But Matt informed us to get out of Auckland with minimal traffic we needed to leave at; get this, about 5 am. YUCK! And he needed to work in the am so we cut the evening short. 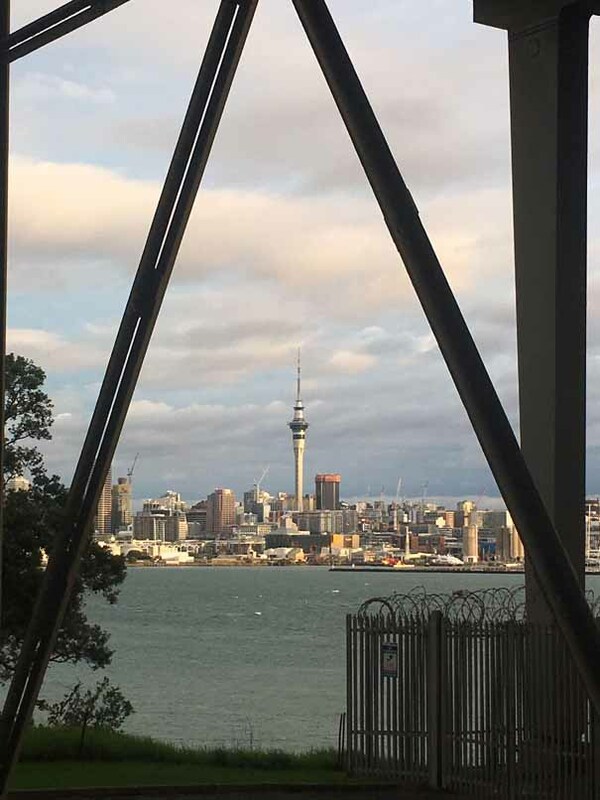 Auckland is a unique city and we will return. Luckily, it is not far from Whangarei. By 5 am we were on the road. The Nor Easter had blown through but the tail of it was still around. Fortunately an auto isn’t effected as much by the wind and rain as a boat. We soldiered on. For the most part the views here were same ol’ same ol’. The mountains and forest while majestic had no majesty. We were using Waze to guide us south and soon discovered while NZ is a first world country the cell connections are not country wide. Throughout NZ the Department of Conservation (DOC) parcels we had no reception. No reception did not mean nothing to look at. 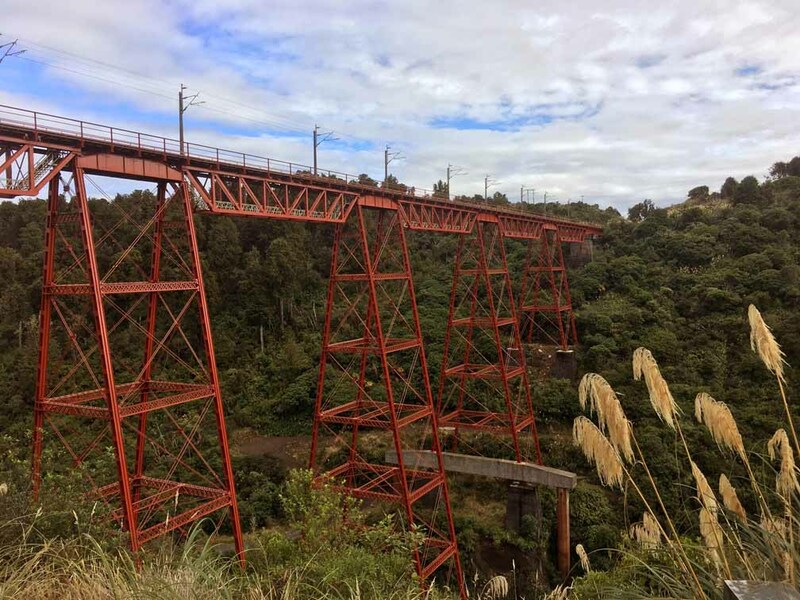 We came across the Makatote Viaduct. It was a railroad bridge spanning a gorge. And WOW! While it would have been cool to walk out on it I wouldn’t want to face a train coming down the tracks. You could save your life by jumping but that then would shorten your life by the landing. This railroad track opened up settlement to the south end of the north island and while the new European immigrants took advantage of that day I am sure the Maori (local residents) might well now curse it. To complete the bridge the company actually built a steel mill on site. They found the production and transportation of the steel beams to be more problematic than building a mill locally. I can only imagine how one might think today of our international manufacturing and shipping now! We stopped in Bulls for lunch at the Mother Goose diner. An avant guard restaurant stepped back in time; all except for the prices. The food was satisfactory and there was one surprise. I’ve had egg on pizza; in the Caribbean, but never had egg on a steak sandwich. Here I had an egg; sunny side up on my steak sandwich. After switching drivers several times we arrived in Wellington. We changed for the most part because; driving for us on the wrong side, was tiring and we needed to stay ultra alert. Too when I am included in the equation that means more driving for W/. Driving seems to put me to sleep faster than any other means, and sleeping is not advisable on any roads. We arrived in Auckland during rush hour and wove our way through the streets to another AirBnB. Discovering the AirBnB residences are a challenge for us. But Waze has no difficulty as long as we are connected to the internet. And in most cities and towns in NZ we’ve had internet. Our Wellington host is gracious and directs us to pick up some items we’ve neglected to buy and need. Additionally she tells of a great place to have some chow. In NZ we now have a 3rd connection for wall outlets. In FP and Fiji, the wall outlets were double post. In the US they are parallel blades and NZ has angled blades. I needed some angled blades for our computer / tablet / phone chargers. Luckily we found the Apple connections at a Harvey Normans store. We did bring most of our electronic gear. We snap and back up hundreds of pics of out travels hoping to have a few memorable ones. And too, the technology tools enables our bragging to the rest of the world of our adventures south.